Welcome to our March challenge. As it's St Patrick's Day in March, I thought I'd challenge you to use GREEN on your cards/ATC's/projects.... as long as there is a die or some embossing done with your Die cut machine.... It does not have to be related to St Patrick's Day, any theme will do. Just let me see GREEN!!!! and look what one lucky player this month will win. Isn't this just awesome. Thanks heaps Hero Arts! Our contest rules can be found here. To Post your entries you will need to upload your photo to either your blog or flickr photo stream and follow the Inlinkz instructions by clicking the link below and follow it step by step. We will be putting a link to this post on flickr so you find it easily to enter your projects. If you have any questions please address them on our flickr group, and one of our Mods will get to you when we can. Be sure to stop by through out the month, we have lots of fun stuff planned for you! For some of you I know it is very busy and you just can't wait for the weekends to come, and we are halfway there! so here is some fun jokes, sayings and stories to cheer you up and get you through the rest of your week, all are valentines/love related and some may even be good enough to put in our cards! Roger, who was 19 years old, was buying an expensive bracelet, to surprise his girlfriend on Valentine's Day, and ws discussing his needs with the jeweler at Tiffany's. Roger retorted with a glint in his eye, 'Not exactly romantic, but very practical. This way, if we break up, I can use it again. Roses are red violets are blue, don't kiss me once just make it a few. I'm a great artist, I've painted you on the wall of my heart, I love you with all of my art. I could go on and on LOL there is so many funny ones out there but these were my favorites. Enjoy the weekend is near! Hannah and the DCD Design team. I love to be untraditional! I hope you have all been having fun with this challenge, as I have coordinating it, and I happy so many of you could join us! Valentines may be over but that doesn't mean we don't need to make anymore cards with the "love" theme, and part of doing an untraditional valentine is not putting Happy Valentines day on your cards, so with the holiday over, any card that says "I love you" or anything in the love theme it will be eligible for our challenge, just remember don't combine red, pink, and white on your cards/projects. If you are like me doing the normal is not an option, and being different is all the more fun. So when I came up with this months challenge, and I knew I needed to do valentines, but I had to change it up; no more pink, red, and white cards for me! and if I asked you all to just make valentines that would be way to easy for you, so of course that really made traditional out of the question, because what is a challenge that isn't challenging! 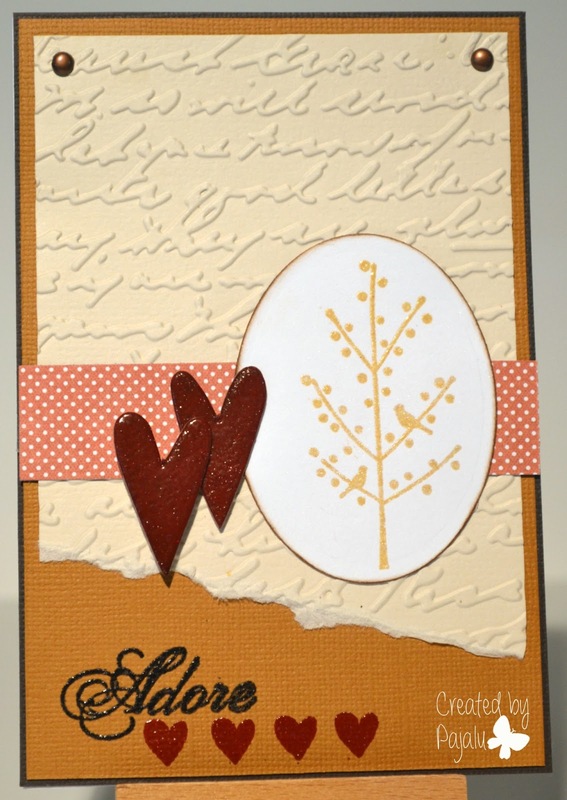 And here is a little tip for you on making things untraditional: Tthe trick I used for this challenge was to just make my everyday cards for any occasion, and adding a "love" sentiment, so I didn't feel forced to go along with the color theme. special to those who recieve it. Again thank you for playing along with us, we are looking forward to making this a better blog, giving you tips, tutorials, and fun challenges, all with "YOUR" favorite die cut machine. Have a wonderful weekend! and don't forget to check back wednesday for our final post for the month of February. Thanks Maria for such a fun week! it was great getting to know you better, and we loved your tutorial! Since this is your final day, I just wanted to showcase some more of your cards, to show our readers. And that is just a few of my favorites! Please check out her Photostream and leave her some lovely comments. If I did it right you should be able to click on the photos above to leave comments on them too. I’d like to thank the Die Cut Divas for inviting me to share my cards with all of you. These ladies are so kind and encouraging – especially with their fun challenges, tips and sweet comments. I hope you’ve enjoyed visiting their blog and plan to come back for more. It’s not too late to participate in this month’s challenge, so c’mon… give it a try! In keeping with the Valentine’s motif, I would also like to invite you to check out a fun new Flickr group…LOVE! 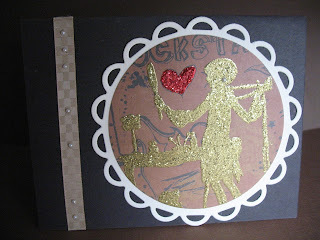 – Handmade cards, ATC’s & other Crafts (http://www.flickr.com/groups/lovehandmadecards/ ). Join us here for inspiration, encouragement and a friendly place to post your beautiful work. We’d LOVE to see any items with a “LOVE YOU”, “MISS YOU”, "THINKING OF YOU' or "FRIENDSHIP" theme. There’s no limit to the kinds of items you can post here as long as they fit the group theme. There are no product requirements – unless specifically indicated for a challenge sponsored by a specific company. Crafters of all ages and nationalities are welcome to participate. In fact, we encourage you to invite all your friends to join in. Make sure you stop by our group POOL and leave some LOVE for your fellow members. Don’t forget to subscribe to our group feed so you can keep up with the Discussion Threads and feel free to start new discussions to share your thoughts and news with the group! 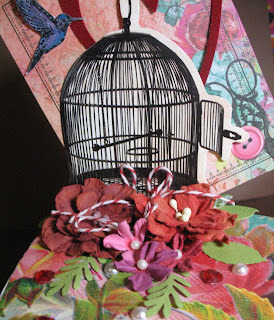 Our Guest Designer Maria, is sharing a tutorial today for this lovely card. 1. Cut a piece of white card stock (CS) to 11 x 4.25 inches, score at 5.5 inches to create a card base and set aside. 2. Cut a second piece of CS to 4.25 x 5.5 inches. 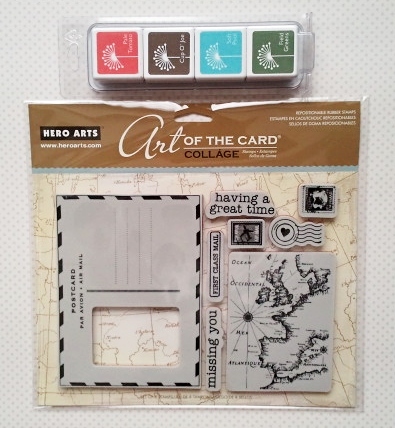 Stamp the Hero Arts Woodgrain Background in clear or white pigment ink. Heat emboss the image using clear embossing powder. 3. Trim this piece down to 4 x 5.25 inches. 4. Die cut the letter “u” from textured yellow CS 3 times. Glue the 3 pieces together to form 1 embellishment and coat with Stickles or glitter glue. Set aside to dry. 5. Arrange dies as shown and secure them with masking tape. TIP – Use masking tape and a grid to easily align letters and spacing. 6. Run panel through your die cutting machine. Remove the edge die and place the letters in their second position. 7. Run panel through the die cutting machine, move the letters down and cut one more time. 8. Carefully trim the top cut all the way to the edge, remove any remaining pieces. 10. 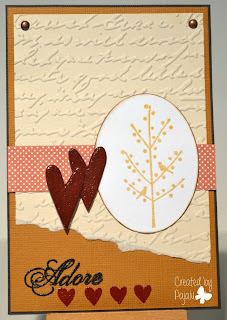 Adhere the letter U next to the third die cut “love” with Glossy Accents or another good glue. 11. Add dimensional adhesive to the back of the panel and adhere to card base. Thanks for the tutorial Maria! It was so sweet of you, to give us all step by step pictures along with the instructions! If you all want to see more of Maria's lovely work We'll see you back here Friday! Introducing Our guest Designer... Maria! Die Cut Divas let’s get to know....Maria Fernanda McClure! I was born in Argentina, raised in the Washington, DC area of the United States and went to University in Montreal, Canada. I’ve been married for 10 years to a wonderful man who has a vague understanding of my hobby yet indulges that need for me to disappear into the crafts room every now and then. My two beautiful daughters, Maddie (8) and Catherine (4) keep me busy with their antics and scheduled activities. Fortunately, they both love stamps, ink, paper and scissors as much as I do, so there are some good times in our basement hideout! I go by MadCat2002 on Flickr, an alias based on my girls’ names. Having worked in the Real Estate and Research industries for many years before having children, it was a big change becoming a stay at home mom. I wouldn’t change a thing, but I am always looking for something to keep myself and my brain busy, whether it’s volunteering at school and in the community or connecting with people around the world who share my interests. I’ve always liked to do crafty things, but my love for stamping and card making started in 1999 when my mother gave me a small mermaid stamp, embossing ink and powder and a heat tool. Once I saw the magic that happens when you heat the powder, I was hooked! About an hour later I was in the closest stamps store learning all I could. I took some classes and started quite a collection, but I was not so focused. For me the most fun came from the social aspect and learning from others. When the store closed, all of that was gone. 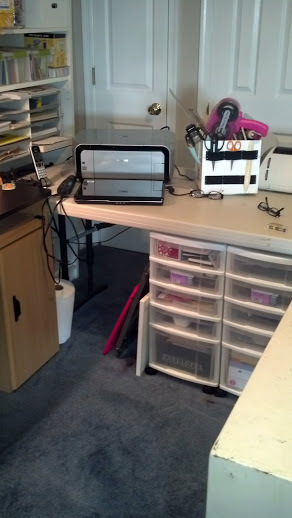 I dabbled a little here and there, got married had children and then found there was not a lot of time for crafting. About 2 years ago, while looking for a Cricut tutorial, I found blogs that eventually led me to Die Cut Divas! 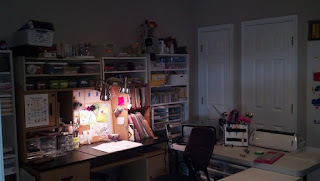 In the process I also realized that the internet now offers a wealth of information and an opportunity to connect with crafters all over the world!! I may not have the local craft shop anymore, but I have certainly made some wonderful friends. In a good week, I might make 3 or 4 cards, but there are times when I just can’t make the time for even one! Fortunately, The Hero Arts Flickr group holds 90 minute scrambles every two weeks. Even I can set aside an hour and a half to just immerse myself in one challenge. It’s fun knowing that there are women doing the same thing at the same time across several continents! My favorite tool just might be my Cuttlebug. I used to use it only for dry embossing, but have now started collecting the thin metal dies as well. The fact that so many companies are now coming out with matching stamps and dies is fantastic!! I love the look of paper piecing and fussy cutting, this just gives me a faster way of achieving a similar effect. My Cricut is a great tool for larger projects, but I am very tempted by the capabilities of the Silhouette. Hmmm… maybe sometime soon? I love adding pattern and texture to cards through a variety of techniques – whether it is dry embossing, raised die cuts and the shadows they create, or emboss resist inking. I’d like to improve my eye for balance and detail. I know it when I see it, but have a hard time achieving it myself. Thank goodness there are some fantastic online classes and blogs where we can learn more about design principles. Ultimately only practice will help me get there! That being said, I am in awe of the many, many talented paper crafters who bring us amazing work and inspiration week after week. Not only do they come up with jaw-dropping designs, but they graciously share their tips and techniques so all of us can improve our work. 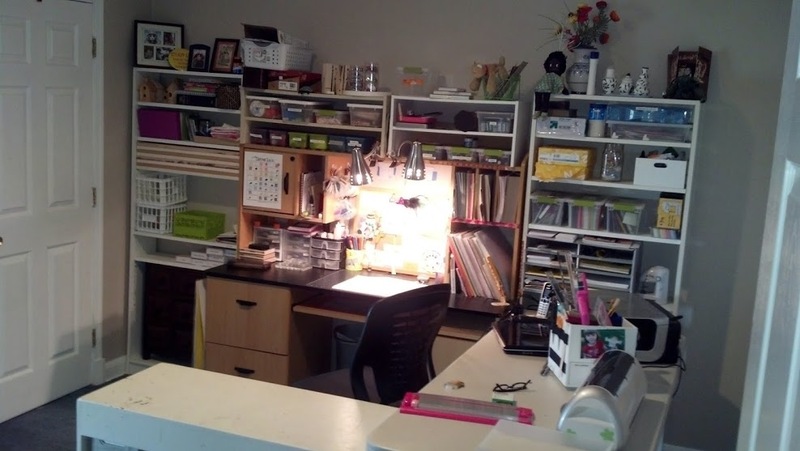 Remember… don’t just peek at the inspiration pieces when you visit a challenge blog. Make sure you take a moment to stop by each DT member’s blog too. You are bound to learn something and you might make a new friend along the way. I don’t have a blog, but do keep a Flickr photostream where I share the cards I make. You can see it here: http://www.flickr.com/photos/madcatink/. As a relatively new member of the outstanding Hero Arts Flickr group I found a wonderfully encouraging and supportive family of crafters. I love their enthusiasm and the incredibly informative discussion threads that keep all of us engaged. Last December, one of my Flickr friends (Debbie of Vancouver Island) proposed that I start a new group to run a Valentine’s Card Chain. The idea was to just use it for seasonal challenges, but then I saw an opportunity to create a group where we could all share cards made with stamps and products from other companies year round. We gave the group a Love/Friendship theme and have invited crafters with varied interests to participate. With 94 members in just under 6 weeks, we’ve held our first Valentine’s Card Chain exchange and are looking forward to more fun throughout the year. 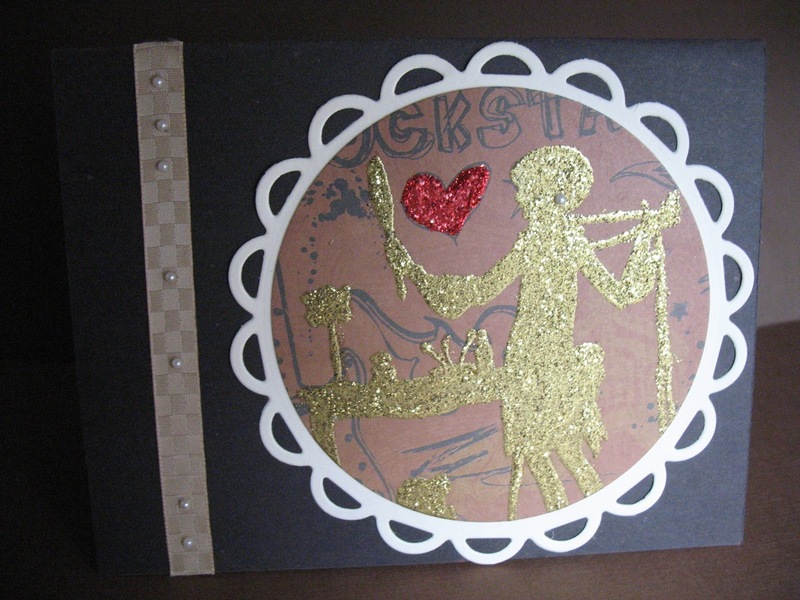 HERE, you’ll find not only love-themed handcrafted cards, but also ATC’s, Zentangles and home décor projects. We hope to grow the LOVE! group into a place that offers a similarly encouraging and informative atmosphere as the Hero Arts group for those who create with products from other companies. I do hope you’ll visit, enjoy that you see, leave some LOVEly comments and join in the fun. We’d LOVE! to have you. Thanks Maria, it was great getting to know you! and may I say what a nice craft space you have. Ladies, if you would like to see more work of Maria's Check out the above links and come back here Wednesday to see what Maria has made for us! Happy Valentines Day! I hope you all have a wonderful day. To me the greatest thing about holidays is family traditions, and the way it brings us all close together. It has become our tradition every valentines to have chocolate fondue with fruits and cakes. it is so delicious, all have fun dipping in the big pot, and who doesn't like a treasure hunt! they are great for any gift giving holiday, and not just for Easter. My little sister and brother, have recently discovered this, and have asked me to hide all the gifts and give them little clues or maps to help them find them, and I have a feeling they'll want it like that from now on. So I cut out a bunch of ticket stubs off my silhouette, and little pockets, and filled them with clues. I tried this on my big brother for his birthday awhile back and he wasn't to happy about it, but the little ones were so jealous, it was too funny. So I wouldn't try this on the big kids or adults but little ones just love it. What is your plan for Valentines? we'd love to hear, and pictures would be fun too! so I have set up inlinkz. Just link us back to your valentine blog post or flickr photo, and I'll leave it open till the end of February. If I have time tonight I will put some pictures up from our family fun and share them friday morning. 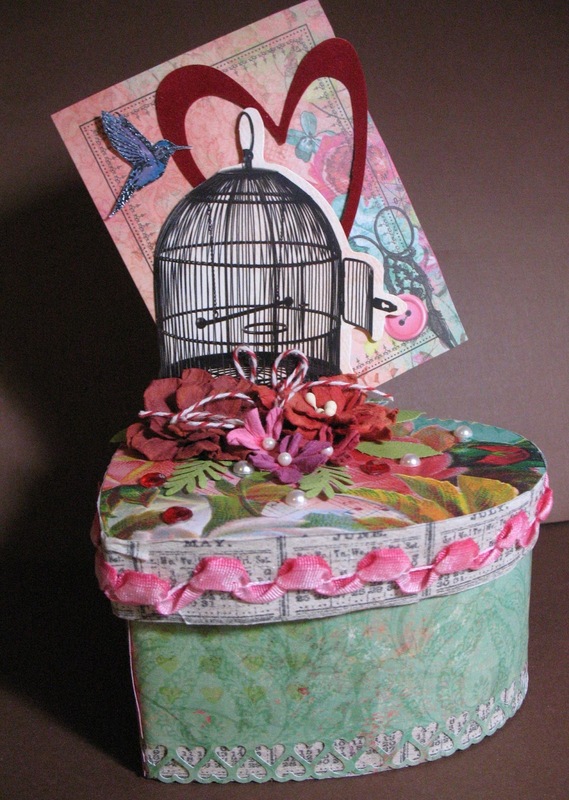 How did you like Arlenes Heart Box she posted about Monday, wasn't it lovely? Today I will be sharing a short video I put together for you.....Okay it's not very short it's nearly 8 minutes long, so you may want to grab your morning muffin, afternoon coffee, or evening desert, depending on what time of day it is for you, before you sit down and click the play button. I thought it would be fitting to do a video about sandwhiches for the bigshot as our first video, for those of you who are new to it or maybe considering a purchase. Boy! was it fun getting this video together, I could put a whole blooper reel at the end of the clip, but I think it would've been longer then the video itself. I had so many mess-ups, mainly the ones where I'd go completely blank, after pressing the recording button and I'd just stand there dumbfounded, or I'd stutter terrribly. ......Anyways I hope you enjoy it and find it helpful. Before I go away I did want to mention real quick that, this was my personal video and youtube channel, and not part of the DCD, so when and if you subscribe, you will not see any other videos besides my own and some may have nothing for or about the DCD. So if you do subscribe hoping to see other videos for the DCD you will not find anything. Eventually we might have a group channel but for now it is just the DT's personal channels. Hannah has been teeming with Valentine ideas and projects. She let me steal a day to show you what I created for this month, by accident. 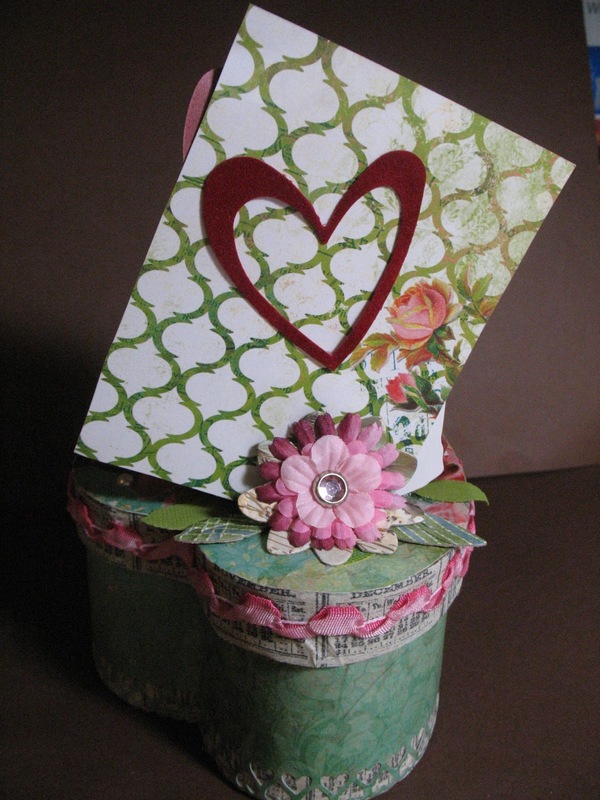 I never would have made a Heart Box, but I went to an all-day event at "The Stamp Art Shoppe" and played ALL DAY! Here is the result.... well, one result of this all day work-out! hehe Now I can show off this great little box as an example of colors used for Valentines, other than only Reds or Pinks! And why would I want to do so? 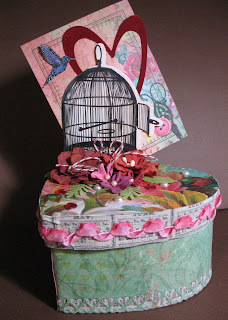 Follow my link to Die Cut Divas' February challenge! The Box after decoration - it was a plain cardboard box before this whole process. The wonderful bird cage is a chip board cut-out that was in one of our packages. The heart is from my Provo Craft die. The bird is a stamp from the Hero Arts Antique Engravings clear set (CL383). The heart is from my Provo Craft die. Close-up of the top of the box. I really enjoyed making this box and it was fun to work with women who enjoyed the process as well. See my February 5th post on my blog for photos of how spoiled we were at "The Stamp Art Shoppe". 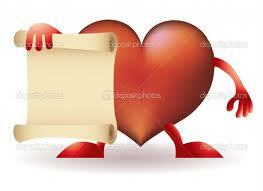 Happy Heart month! I'm back with my final card this week showcasing my favorite die. I hope you aren't all tired of my brown cards! It seems to be my go to color lately and works in every category. I wanted this card to be completely void of the "valentine" color scheme, to fit this months challenge theme and it was fun to do something different. For this example using the die, I embossed it to show you how neat it looks, without dressing down the elegance, for a more fun card use a folder with more of a bold design. I chose my embossing folder and dies in this case the flowers, nesty rectangles, and Swiss dots folder, and ran each piece through the machine. For the rectangles I placed them on the matt together holding it down with a small piece of tape putting the smaller rectangle inside the larger for the frame effect. next I distressed my card front, the flower/leaves, and the rectangle frame, and ran the flower in the embossing folder. I stamped the background on my card front using the same color I distressed it with, finally I assembled all my layers and adhered them together and stamped the sentiment on the white panel. Please Join us back here Monday for some more fun. Hello again friends and readers! If you haven't read Monday's post Here, I'm sharing cards I made using my favorite diecut of the month throughout this week. I cut an 8 1/2 x 11 card base in half lengthwise at 5 1/2 and a card "front" at 4 x 5 1/4 distressing the entire piece with vintage photo distress ink, and stamped my background over it with white dye ink. Next I ran my flowers through the machine on plain white cardstock and colored them both with aged mahogany distress ink, then I squirted some stardust stickles and rubbed it with my fingers over them and heat set it to quicken the drying process. For the stem and leaves I distressed a scrap (the corner of my finished diecut flowers) with both mowed lawn and peeled paint distress ink, cutting at a slight curve for the arched look, the leaves were made using a small portion of my circle punch. I ran some adhesive along the stem and leaves and put them in place then I layered the flowers bending the petals slightly up and put a little dot of glossy accents to hold the flowers together, and put them on my card to finish it off. Thanks for stopping by again! I hope these cards are inspiring you to join in the fun! Take Care and I hope to see you back here, Friday for our final day using my favorite diecut. And the Die Cut Diva's Design Team. This week I will be sharing projects using my favorite die of the month. 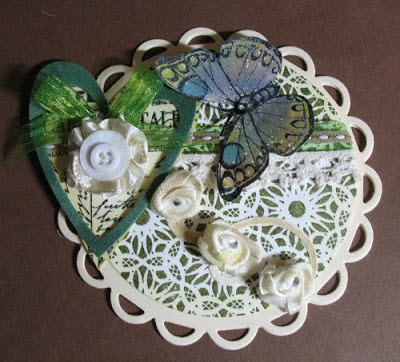 I find myself always reaching for Tim Holtz's Tattered Florals bigz die. there is so much you can do with this. I like to cut them out with white cardstock and then use my distress inks and sometimes some stamps to decorate them, I have even run them through an embossing folder and then layered them. Here is my card for the day using the largest of the four flowers. so this card is a simple version using brown, red, and white, more specifically fired brick and vintage photo distress inks on white cardstock. I cut an 8 1/2 by 11 piece of white cardstock, lengthwise at 5 inches making it slightly smaller then your normal card and folded it in half. 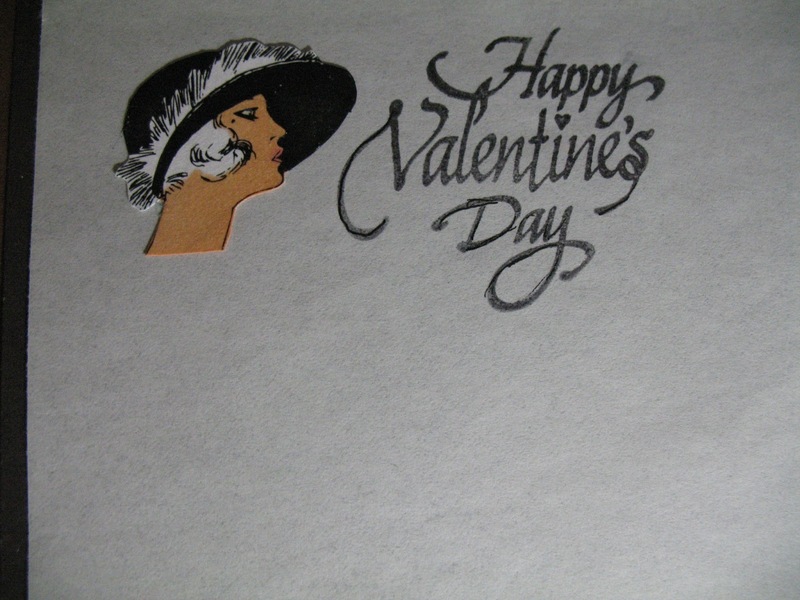 Then I inked my background stamp with vintage photo and applied it to the front of my card and set it aside. Next I ran my flower die through the machine, and stamped my image onto it and distressed it with fired brick, I then pressed it on my versamark inkpad and poured some sparkly clear embossing power over it and heat set it. I then punched a heart out of some scraps and colored it with my vintage photo marker. With another scrap I cut it 3/4 in thick and 4 1/2 long and distressed also with vintage photo then inked my border stamp with fired brick across it. Finally I assembled all my pieces and adhered them together on my card base. Vintage photo and fired brick distress ink and vintage photo marker. Embossing Antiques (by Ranger) Frosted Crystal embossing powder. I hope you enjoyed reading this as much as I did sharing! I'll be back Wednesday with another card using my favorite die of the month to inspire you. Hannah and the Die Cut Diva's Design Team. Our Second Month of the year has begun, and that you should all know by now; means it's time for a new challenge. Because this is the "official" month of love, I am going to challenge you with making Valentines. But don't think it will be so easy for you! there is a twist as well... I want to see untraditional valentines, and by this I mean not your normal pink red and white color combinations, all of which you can use, but not together on the same card/project. and as a second option you can use embossing powder on your valentines, to which the above rules do not apply, as long as you use embossing powder. 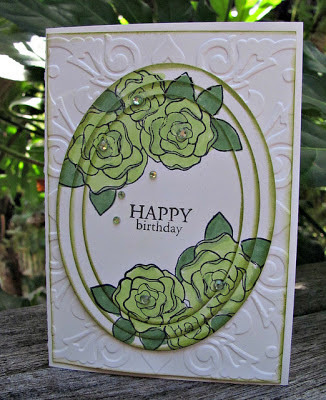 All cards/projects must be made using at least one die cut or embossing folder, using any die cut machine you may own. Limits are 4 projects per person per challenge.